Police in Indian-administered Kashmir have stopped more than 100 Hindu pilgrims from trekking to the Hindu cave shrine of Amarnath. 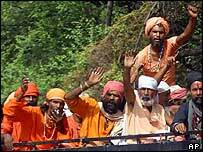 The pilgrims, mostly Hindu holy men, set off on the trek two weeks ahead of the official start of the pilgrimage. They were stopped on a road leading to Sonmarg which serves as the base camp for the journey. The state authorities are keen to limit the pilgrimage as it requires tight security in this disputed region. The pilgrims staged a protest sit-in against the police action. Reports say the pilgrims set off on the journey ahead of the official schedule at the instigation of the Amarnath Yatra Action Committee which is opposing the state administration's decision to limit the pilgrimage to 45 days. The Amarnath shrine is situated almost four thousand metres above sea level.